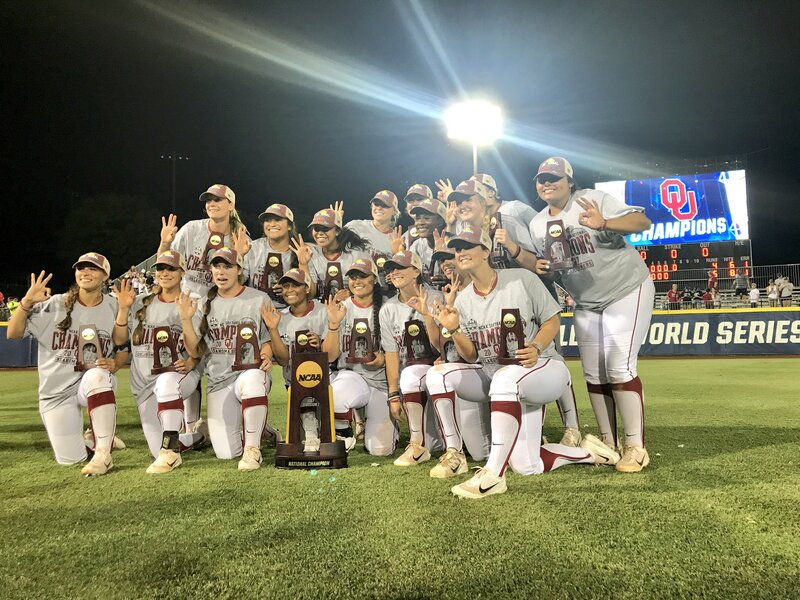 The Oklahoma Sooners swept the Florida Gators in the 2017 Women’s College World Series Championship Series to win their second straight national title. The Sooners won 5-4 and completed an undefeated stint at this year’s WCWS going 5-0. It was a great run for Oklahoma as they lost their opening game of the regional they were hosting and then ripped off 11 wins in a row en rout to the title. The Sooners have now won three of the last five National Championships including last year’s. In this year’s clincher, the Sooners started the bottom of the first with a Nicole Mendes solo shot, her second in as many games. Florida responded in kind with Sophia Reynoso hitting her own lead off solo shot in the top of the second. The Gators added two more runs on a single by Aleshia Ocasio and when Kayli Kvistad was hit by a pitch. Florida held a 3-1 lead after an inning and a half. Aleshia Ocasio sneaks one through the infield! Oklahoma wasted no time regaining the lead in the bottom of the second. The Sooners loaded the bases with two outs when Caleigh Clifton drew a walk to make it a 4-2 deficit. Game one heroine Shay Knighten had a bases load opportunity and took full advantage clearing the bases with a double. That put the Sooners up 5-3 and it would also prove to be the second straight game Knighten recorded the game winning RBI. Florida drew one run back in the top of the third on a solo shot by Chelsea Herndon. They would not see a runner get to second base until the sixth inning, but a line out and strike out ended that threat. The Gators went down in order in the top of the seventh to give Oklahoma another National Championship, their fourth in school history (also won in 2000, 2013, and 2016). Nicole Mendes started the game at pitcher for the Sooners going one inning and giving up one hit. Paige Parker allowed three runs on four hits while Mariah Lopez gave up the one run and earned the win. Paige Lowary finished off the game with two perfect innings and three strikeouts. Shay Knighten had just one hit on three at bats, but it was a big hit driving home those three runs. Caleigh Clifton was the only Sooner to record multiple hits going two for two with a walk and a run scored. The Gators opted to start Aleshia Ocasio in the circle and she gave up four runs on four hits in 1 1/3 innings while taking the loss. Delanie Gourley came on in relief giving up one run on four hits with five strikeouts. The offense for Florida was spread out as six different batters recorded a hit (no batter had multiple hits). A close and enthralling contest needed more than two full games to decide a victor. Oklahoma won 7-5 over Florida in 17 innings as they took a 1-0 lead in the 2017 Women’s College World Series Championship Series. 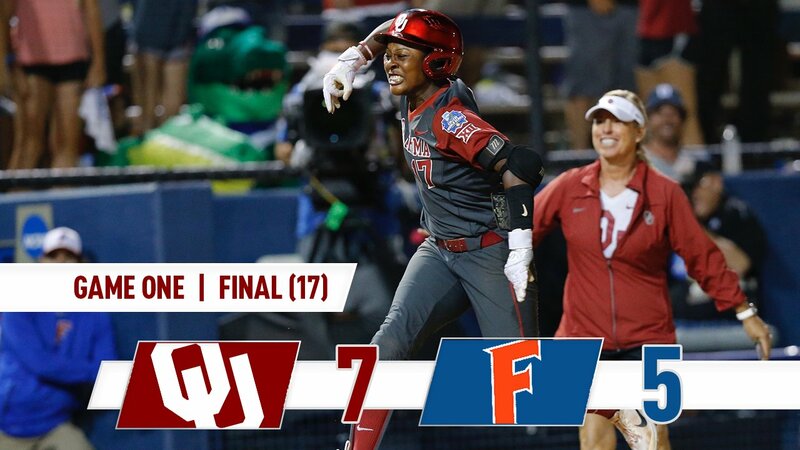 Shay Knighten’s three run home run in the top of the 17th put the Sooners in front for good after the Gators battled back not once, but twice on their final strike. The game was scoreless until the bottom of the fourth when the Gators got on the board with a single by Aleshia Ocasio that brought home Nicole DeWitt. The Sooners responded right away in the top of the fifth with Sydney Romero driving home Nicole Pendley on a single. Oklahoma took a 2-1 lead in the top of the sixth on a solo shot by Nicole Mendes. The Gators were down to their final out (and strike) when Sophia Reynoso hit a blooper into left-center field. The Sooners were deep in the outfield and could not come up with the catch as Ocasio came around to tie the game up and send the game into extra innings. The teams failed to get much going in the eighth through eleventh innings as neither team had a runner get to second base in those innings. In the twelfth inning, Oklahoma’s Shay Knighten led off with a double and was followed by Fale Aviu, who crushed a two run shot to give Oklahoma a 4-2 lead. The Gators started the bottom of the twelfth with a walk and a hit to put two on with no outs. The Gators then popped out on a bunt and struck out with back-to-back pinch hitters. Amanda Lorenz came up with two outs as Oklahoma went from Paige Parker back to starter Paige Lowary. Lowary got Lorenz to her final strike, but Lorenz was able to drive a ball to the left center field wall for a triple to bring home both runners and keep the game going. The Sooners were able to get runners on first and second in the top of the 15th inning after Delanie Gourley hit Lea Wodach and a wild pitch followed to move the runners up a base. The next pitch was a ball to load the bases, but a ground out ended the threat. In the top of the 16th, Oklahoma put two runners on with no outs and saw them both sacrificed up a base on a fly out to right center. A walk loaded the bases but a force out at home and strikeout left the bases loaded for the second straight inning. The Sooners once again put two runners on base in the 17th and Shay Knighten finally put the runs across for Oklahoma with a three run home run. The Gators were able to load the bases with one out and Lorenz at the plate where she hit a sacrifice fly to cut the deficit to 7-5. A strikeout from Lowary ended the game to give the Sooners the win after an incredible game. See you again tomorrow night! Lowary started and ended the game as she went 10 1/3 innings giving up two runs on eight hits while striking out seven to earn the win. Parker went 6 2/3 innings giving up three runs on four hits with seven strikeouts. Mendes, Knighten, Aviu, and Romero were the only Oklahoma hitters to finish with multiple hits. Barnhill also started and ended the game for Florida, but she took the loss. She pitched 9 innings giving up five runs on nine hits with 13 strikeouts. Gourley threw 8 innings of relief ball giving up two runs on four hits with 13 strikeouts. Justine McLean, Reynoso, and Lorenz all finished with multiple hits for the Gators. The Oklahoma Sooners are one victory away from their second straight national championship. Game 2 is Tuesday, June 6 at 8 PM Eastern Time and can be seen on ESPN. The final two teams for the 2017 Women’s College World Series have reached the pinnacle of the season. The Florida Gators and Oklahoma Sooners are the two teams that will play in best of three series to determine the 2017 NCAA Division 1 Softball National Champion. Results for the Regional round are here, Super Regional Round are here, and the Women’s College World Series are here. The Oklahoma Sooners are going for their second straight National Championship while the Florida Gators are playing for their third title in the last four seasons. The best of three series will start on Monday, June 5 at 7 PM Eastern Time. All three games can be seen on ESPN and we take a look at the path to the Championship Series for both teams. The Gators were the top overall seed in the NCAA Tournament and were one of the best teams all season especially in the circle. Florida has been on the brink of elimination a couple of times in this tournament, but they responded resolutely against Oklahoma State in the regionals and Alabama in the Super Regionals. In Oklahoma City, the Gators hit another gear posting back-to-back shutouts against SEC foes Texas A&M and LSU. They nearly had a third against Washington, but gave up a home run when the Huskies were down to their final out. Nevertheless, Kelly Barnhill and Delanie Gourley pose an extremely formidable duo against the Sooners in what should be a series showcasing great pitching. Oklahoma began the season as the top team, but hit a rough patch early on. Since the Sooners lost back-to-back games against Cal Poly in mid-March, they have been on a tear losing just twice: once to Baylor in the regular season and to North Dakota State in the opening game of the regional. Since the loss to NDSU, the Sooners have not dropped a game though they were nearly eliminated against Tulsa in the regional. However, their last five games against Auburn (twice on the road), Baylor, Washington, and Oregon have been nothing short of impressive. Paige Parker and Paige Lowary will be key in the circle in the same manner as Barnhill and Gourley for the Gators. Below is the schedule for the 2017 Women’s College World Series Champions Series. This is set to be an excellent matchup between Florida and Oklahoma particularly in the circle with four excellent pitchers. 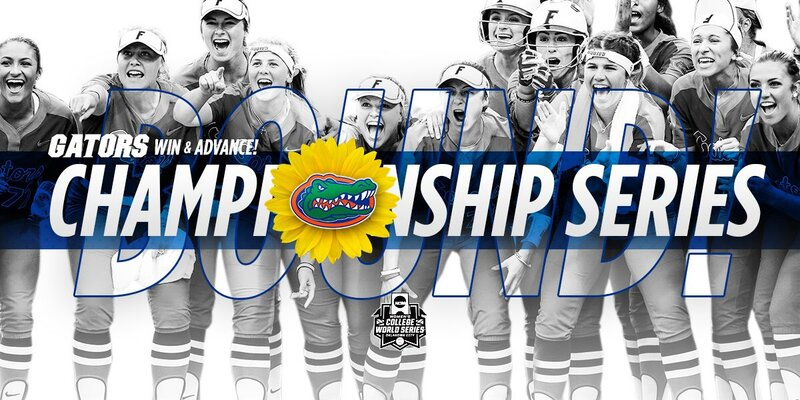 This will mark the fifth straight season that either the Gators or Sooners will go home with the NCAA Championship.